A distribution imbalance between positively and negatively charged elements creates what is referred to as a “potentiation differential.” When APeX Water enters the body, the negative charge of the nano-clusters is potentiated by, and then drawn into, the positively charged pathogens and/or pathogen-infected cells. 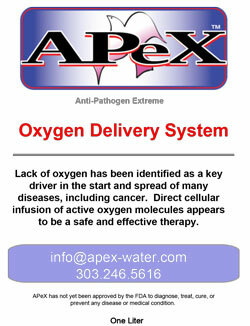 The potentiation differential makes APeX Water’s contact with pathogenic cells unavoidable. They find each other, pulling into each other like north and south magnets. NOTE: APeX Water does not affect positive gut and mouth bacteria, as good bacteria carries a negative charge, which repels the negatively charged silver-oxygen nano-clusters of APeX Water. 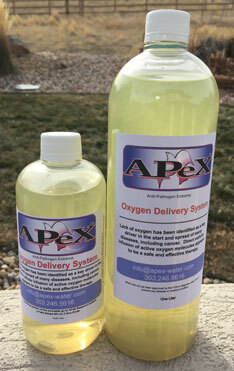 APeX Water brings energy into the cell by supplying the cell with an abundant amount of oxygen through its silver-oxygen nano-clusters. Within milliseconds, the oxygen is released into the pathogen because of the potentiation differential between the nano-cluster and the pathogenic cell. The binding electrons of the oxygen atoms are attracted to the pathogenic molecular electronic imbalance. The inevitable attraction between the APeX Water nano-clusters and the pathogens allow the nano-clusters to enter into the larger molecular structure of the pathogens. Pathogenic cells become oxidized, and cease to be viable. When this happens, the architecture of the pathogen collapses. Destruction of hypoxic pathogens is precise and unavoidable. Yet, the active oxygen molecules are bio-available ONLY during the extremely brief period of time (milliseconds) it takes for the active oxygen molecules to destroy the host pathogen. After the pathogen is destroyed, the potentiation differential that stripped the oxygen molecules from the nano-cluster ball disappears. The active oxygen molecules then re-bind to the nucleus, and the cluster moves on to the next pathogen, and then the next; ad infinitum. This phenomenon has been witnessed with live blood cells in a dark field microscope. It doesn’t matter what the pathogen is, because what all pathogens have in common is trying to avoid oxygen at all costs. This is a pic ture of blood cells under dark field microscopy photography. It shows the nano-sized particles of silver, with oxygen molecules bound to it, entering and exiting pathogenic blood cells. The cell not only needs to RECEIVE oxygen to function properly, it also needs to ABSORB oxygen. APeX Water can’t resolve prolonged stress. It can only bring oxygen to the cells that are ready to receive it.